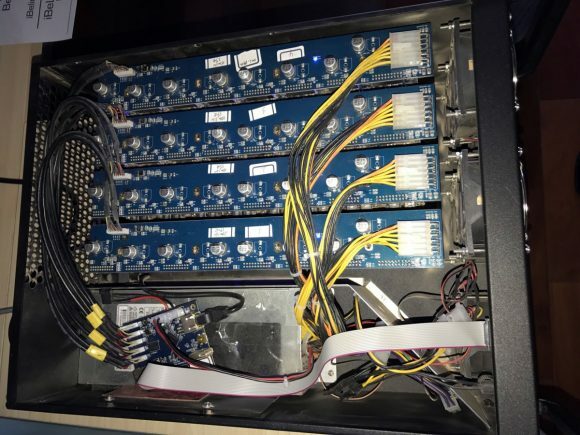 It seems that there is a new significantly more powerful X11 ASIC miner being prepared to be unleashed, a device offering 10.8 GHS X11 mining hashrate for Dash or other crypto currencies using the same algorithm. The iBelink DM11G is apparently the successor of the iBeLink DM384M X11 ASIC Miner that we have tested last year. There is still not much information regarding the new device, although there is a group buy apparently being arranged on Bitcointalk for $6750 USD with minimum order of 1 unit as well as a Russian company Bitbaza taking pre-orders for the device at $7500 USD with a minimum order of 10 units. The new 10.8 GHS iBelink DM11G miner does seem a lot like the first generation from last year and we cannot confirm its existence yet, though there are some photos and a video of the device in action apparently. We had some doubts when we got some information about the iBeLink DM384M last time, but then again when we have purchased one unit it turned out real and delivered what was promised. So threat this information with caution for the moment, but also be aware that this product might be hitting the market in a couple of months (3 months for shipments to start). Do note that also getting in early with a so powerful hardware can make it easy and fast to get ROI on the investment, but if the manufacturer of the device manages to put out a lot of units the profitability can also quickly diminish in a matter of a month or two. Other competitors in the X11 market might also soon release updated products to match the hashrate of this device as well, especially with the 3 month shipping time for the iBelink. If you are in the market for X11 ASICs then you might want to reconsider as the profitability at the moment is nothing like when the first batch of iBeLink X11 miners started shipping. Now iBeLink is shipping to customers their second batch with a limit of up to 3 miners per customer and PinIdea, another company also started shipping their faster and more power efficient miners (1 per customer), though they had some shipping issues, so there could be delays. Later this month, apart from the large 384 MHS ASIC from iBeLink and the 500 MHS from PinIdea, we are waiting the release of smaller single chip USB X11 ASIC miners from PinIdea in the range of about 8 MHS per device to help the decentralization. On the image above is a quick check of the current profit for miners using X11 ASICs from iBeLink, selling your hashrate is still the most profitable, but not by much compared to directly mining for DASH. 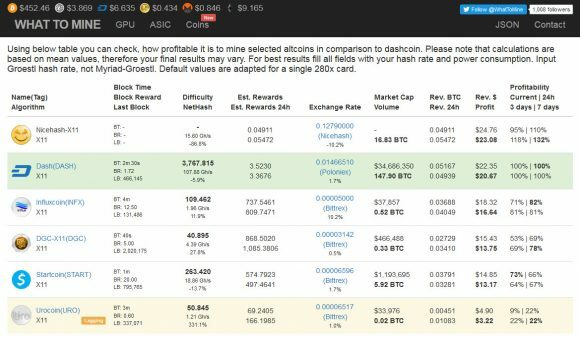 You are going to be getting about 0.05 BTC or about $25 USD or about 3.5 DASH per day with that X11 ASIC at today’s rates, but you can expect that the profit will go down with more mining hardware becoming available. This is the situation with the faster and more power efficient X11 ASIC miner from PinIdea, faster and more energy efficient, but also more expensive to purchase. You can expect to get about 0.65 BTC or about $32 USD or about 4.6 DASH per day with that X11 ASIC miner at today’s rates and the numbers will also go down with more miners getting released. 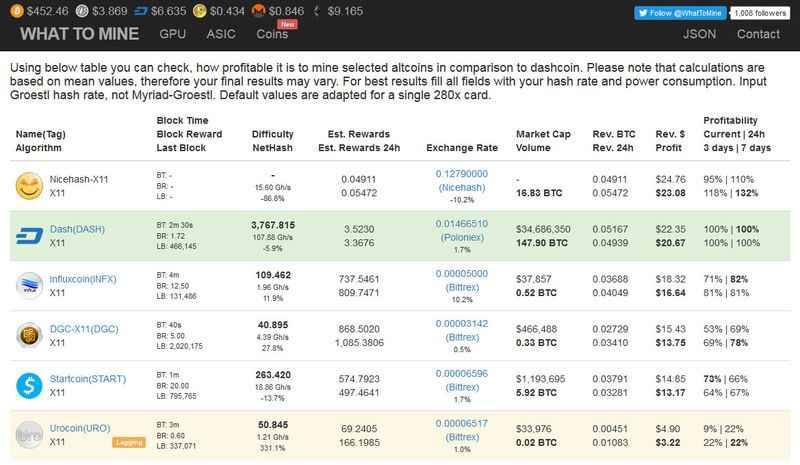 The problem with the release of a lot of X11 ASIC mining hardware is that the X11 market is still relatively small with only Dash having a very strong and big network at the moment and not that many “big” X11 other altcoins, not that many in overall as well. As a result in the short term we might see a decline in the profitability for X11 especially with more big ASIC miners coming online and even though GPU miners would start moving away from X11 you should still carefully consider to invest or not in X11 ASIC hardware at the moment. On the long term however we expect to see the transition of X11 from GPUs to ASIC miners and though it may be a bumpy road, hopefully things will not get out of hand and a lot of X11 hashrate getting centralized in the hands of few essentially leading to the loss of user interest in everything X11 and coins forking to other algorithms. THe first X11 ASIC miner on the market was iBeLink DM384M that was released about a month and a half ago in a limited 50 units first batch and we were lucky enough to purchase one of the first units available from Dual Miner. We have since tested and played quite a lot with the device and we have since shared a lot of things we like about the device and some that we don’t. With DualMiner.com opening pre-orders for the next batch it is time to share a few more things that we do not like about the iBeLink DM384M, so that people that might be considering to order the device be well aware what to expect from it. The next batch that is up from pre-order is expected to start shipping by the end of next month, so a lot can happen before the devices start shipping including a competing product becoming available for order without so much waiting time. But lets get back to the iBeLink DM384M X11 ASIC miner and what we don’t like and should have happened in the timeframe of about a month and a half since the first batch of devices started shipping. On the software side, still no source code of the cgminer is available for users to modify and integrate in sgminer, bfgminer or another software miner or even compile for Windows or other operating systems. The fork of cgminer available is only in a binary form for Raspberry Pi and even the binary is not usable for custom setups as it apparently has built in protections that don’t allow you to use it in other environment than the one you get it preinstalled on (the RPi shipped with the miner). You can get inside the Linux shell on the Raspberry Pi controller of the miner and try to add another root account or change the password for an existing user, but you will not get very far. Thanks to the built-in protections in the cgminer it will refuse to run if any modifications in the environment such as changed passwords or new users are detected and so far iBelink has not released the password for the device so you cannot ssh to it using an existing user. So the only thing left is apparently for somebody to brute force the password of the device as iBeLink simply does not give us another option. Still on the software side, there has not been a single update to the web-based interface that is available for the user to control and monitor the device and that software does need some fixing and new features. The numbers you get reported are a bit weird and confusing, so you might have trouble getting a good idea on the status of the hardware other than if it works and how well it works – you will have to monitor poolside for the real performance. But that is not the big issue, there are features that are simply needed and not available and apparently will not be introduced such as password protection for the web interface or load balancing pool strategy to help you spread the high hashrate among lower difficulty coins for example. This might not have been that bad if if users had the access to the divide that would allow them to modify the software themselves and add features that they may need, unfortunately iBeLink locked this option out. We have already seem modified and improved firmware for various ASIC miners made by users that add missing features or improve the performance and reliability of the hardware, but for the moment we are not going to be seeing this happening for the iBeLink DM384M X11 ASIC. Enough with the software, let us get started about the hardware and what to expect on that side from the iBeLink DM384M X11 ASIC. Solid build, adequate performance as per the official specifications, but noisy and at a level that simply makes it not suitable for use by home miners. Server grade chassis, cooling fans and even power supply ensure long term reliability unless you put it in a very hot environment where you might have trouble with any other hardware anyway. If you are considering to modify the miner to make it quieter and usable for home miners that do not want the excessive noise from the cooling solution, then you will have some more trouble. Half of the noise of the device is coming from the power supply and you will be having trouble replacing it with a standard ATX PSU that is much more silent. The reason for that is the non-standard power connectors used by the blades with the chips that the power supply uses, a 12-pin power connector that may be found on some other server products, but not with the same pinout. Apart from the 12V yellow cables and the black ground cables you have a single 3.3V orange cable on every connector, so you would need to do some modifications to the regular power supply to make it compatible. 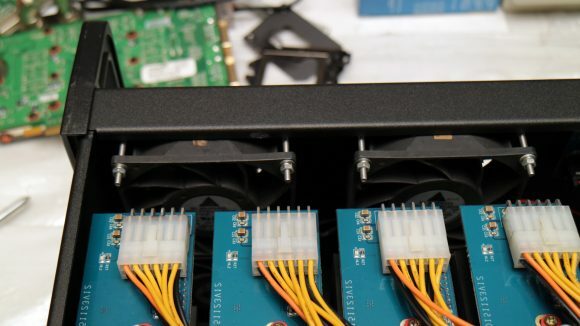 Or you can just desolder the cooling fan of the standard power supply and add in quieter fans to keep it cool, but that would limit you with the length of the power cables as they are designed to be long enough for the standard chassis of the device. Adding enough less noisy, but still powerful enough fans to each of the blades can provide enough cooling and much less noise when compared to the standard cooling setup, but you will need to take the blades out of the standard chassis. So be prepared and know what to expect from the iBeLink DM384M X11 ASIC miner should you consider ordering one or more units. 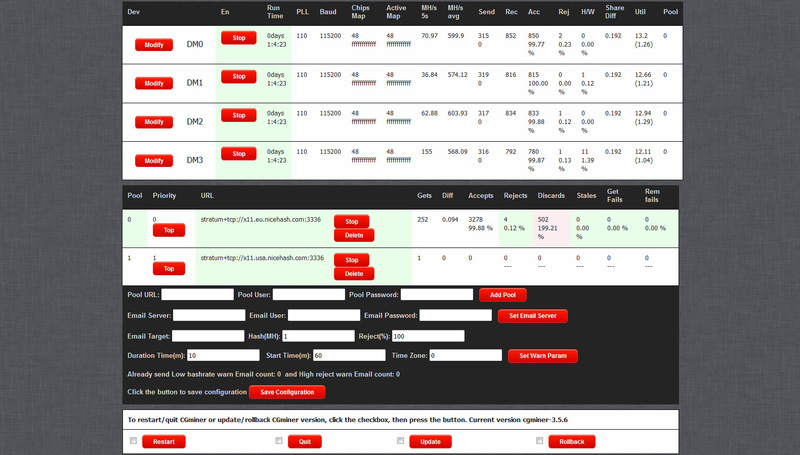 One more last thing before making the final decision, the X11 profitability at the moment is not what it was when the first batch was shipped and there is a chance that it may go even lower once more hardware is available. Unlike the last time when new ASICs were introduced for Litecoin and Scrypt-based crypto currencies, X11 is not that widespread and there are not a lot of strong coins apart from DASH, not even that many X11 altcoins like it was with Scrypt ones. With a limited number of X11 ASIC miners, all big and powerful units, and with GPU miners moving from X11 to other algorithms a centralization of X11 hashrate may as well become a serious problem that can drive away users. But enough with the pessimism, time to get optimistic, as we are probably soon going to be seeing more X11 competition on the market including smaller single chip USB miners to help decentralize things and get X11 ASIC hardware in the hands of many more people.